Key West, Florida. $10 1902 Plain Back. Fr. 628. The First NB. Charter #4672. PMG Choice Very Fine 35.This wonderful $10 Plain Back hails from the "Conch Republic" of Key West, the southernmost city in the contiguous United States. 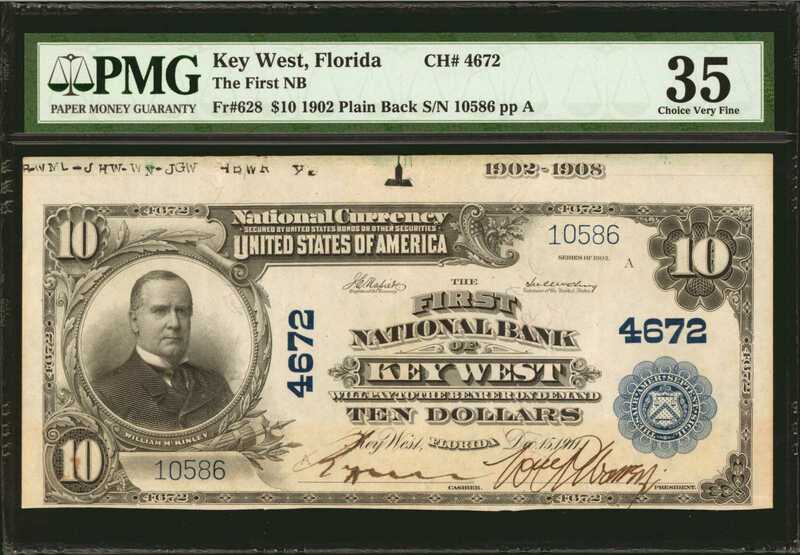 The First National Bank of Key West was chartered in 1891 and issued $1,556,870 worth of notes into circulation through the end of the National Currency era in 1935. The presently offered note has all of the allure of a Key West sunset with bright paper, vivid inks and attached top of the sheet selvage with the engraved 1902-1908 date range. Boldly penned bank officers signatures add to the overall appeal of this moderately circulated note. In all honesty the presence of the sheet selvage would lend us to believe that this note was likely saved as a souvenir and never truly entered circulation. Supporting that assumption is the fact that this note came from the fourth from last large size sheet of $10-$10-$10-$20 notes the bank issued. This newly discovered example came to us "out of the weeds" so to speak and is available to the collecting public for the first time. This is easily among the nicest large size notes available from the bank.